Accounts are manipulated through the /data/ API. Some konnectors are based on an aggregator service. An aggregator is declared in the konnector manifest and specify an accountId property. When Cozy-Home detects this property, it checks if an account with this given id exists. If not, it creates it. Every account created for a konnector based on an aggregator is then related to this aggregator account. This relationship is called parent account. Note: you can read more about the accounts doctype here. Like client-side applications, each konnector has an associated io.cozy.permissions. These permissions are those listed on the manifest of the konnectors, and the stack will add a permission for the files on the folder choosen by the user. 7 - the Store redirects to the Home. The Home asks the user for account config and create a folder to save the PDFs. 12 - the Home uses the realtime to be informed if the konnector fails to login or succeeds to import the PDFs. If the user wants to use several account, the Home can setup several triggers for the same konnector & various accounts. it ensures that the konnector has a folder where it can write its files, and has the permission to write in this folder. The konnector process can send events trough its stdout (newline separated JSON object), the konnector worker pass these events to the realtime hub as io.cozy.jobs.events. Otherwise formatted lines (such as node Error) will be kept in some system logs. Konnectors should NOT log the received account login values in production. type: "messagetype",  // can be "debug", "info", "warning", "error", and "critical"
If there is an error or critical message, the execution will be seen as a failure by cozy-stack. It’s also the case if the konnector reaches the timeout or returns with a non-zero status code. Note: debug and info level are not transmitted to syslog, except if the instance is in debug mode. It would be too verbose to do otherwise. io.cozy.account_types are not accessible to the applications: they are injected directly in CouchDB in a global database secrets/io-cozy-accounts_type. Note: grant_mode must be secret, slug must be the slug of the konnector, but secret can be a map instead of a simple string if several secrets are needed for this service. The secret is given to the konnector in the COZY_PARAMETERS env variable. Service is the website from which konnector aims to retrieve informations. Stack is the cozy stack. Using the access_token: ideally, the konnector should only concern itself with this part; it receives an access_token and uses it. Before beginning the Grant process, most Services require the application to be registered with a defined redirect_uri. There are a lot of options, which we will choose from when actually implementing konnectors using them. A. Register a “proxy” client, which is a static page performing redirections as needed, as was done for Facebook events in v2 konnectors. We will register a well known cozy domain, like oauth-proxy.cozy.io and registers it with all providers. The use and risks associated with this domain should be made clear to the user. B. Register each Stack with a redirect_uri on the main stack domain, if we go this way, the register_uri below moves from bob.cozy.rocks/accounts/redirect to oauthcallback.cozy.rocks/redirect and the domain will be prepended to the state. This is feasible at cozy scale, but requires more knowledge and work for self-hosters. Copy and paste provided Client ID and Client Secret. A few services allows client to register programaticaly through the Dynamic Client Registration Protocol RFC7591, we should allow the Stack to register using this protocol when we first need to implement a Konnector connecting to such a Service. A few services allows to specify arbitrary redirect_url without registering beforehand as a client. NOTE the scope may depends on other fields being configured (checkboxes), this will be described in json in the konnectors manifest. The format will be determined upon implementation. NOTE To limit bandwidth and risk of state corruption, the cozy app should save its state under a random key into localStorage, the key is then passed as the state in this query. This whole object is saved as-is into a io.cozy.accounts ‘s extras field. The Cozy app checks that the state is expected, and restores its state to the form but whith account completed. See server-flow for state rules. C. The Cozy app adds the token to the io.cozy.accounts and save it before starting konnector. To avoid this, the stack will be responsible to perform token refresh. 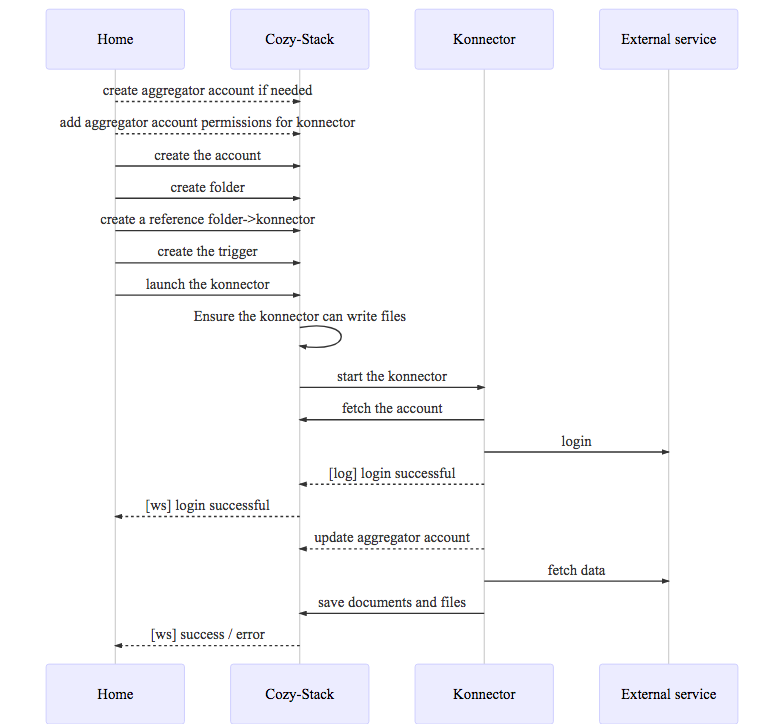 A konnector can requires the stack to refresh an account token with an HTTP request. The following is a few points to be careful for in konnectors when we start allowing non-cozy developped OAuth konnectors. With SPA flow, because of advanced security concerns (confused deputy problem), cozy should validate the access_token. However, the way to do that depends on the provider and cannot be described in json, it is therefore the responsibility of the konnector itself. With server flow, an evil account type with proper auth_endpoint but bad token_endpoint could retrieve a valid token as well as cozy client secret. The reviewer of an account_type should make sure both these endpoints are on domains belonging to the Service provider.